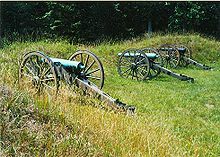 Petersburg National Battlefield is a National Park Service unit preserving sites related to the American Civil War Siege of Petersburg (1864–65). 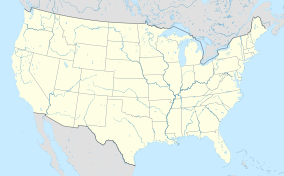 The Battlefield is centered on the city of Petersburg, Virginia, and also includes outlying components in Hopewell, Prince George County, and Dinwiddie County. Over 140,000 people visit the park annually. Sited next to the James River in Hopewell, City Point served as a major command and logistics hub for the Union Army during the Siege of Petersburg. It is located in the City Point Historic District. The 8.72-acre (3.53 ha) Poplar Grove National Cemetery is administered by Petersburg National Battlefield. Reenactors at Petersburg National Battlefield. Established as Petersburg National Military Park on 1926-07-03. Transferred from the War Department on 1933-08-10. Redesignated as Petersburg National Battlefield on 1962-08-24. Added to the National Register of Historic Places on 1966-10-15. Richmond National Battlefield Park, administering areas related to the Siege of Petersburg which are north of the James River and Appomattox River. 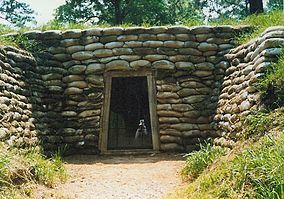 Wikimedia Commons has media related to Petersburg National Battlefield. This page was last edited on 24 May 2018, at 04:30 (UTC).